With plenty of drying space, it's an indispensable addition to your laundry room. Or use it to dry herbs and flowers or to display favorite quilt pieces, linens or crafts. Just mount on wall and extend the dryer out whenever you need it. Note: Mounting hardware not included. Mount on wall wherever you like, using appropriate hardware. Small-Extends about 33-1⁄2". Folds to 20-1⁄2"H x 24-3⁄4"W x 8-1⁄4"D, 22 lb. Large-Extends approx. 40". Folds to 20-3/4"H x 34"W x 8"D, 25-1/2 lb. 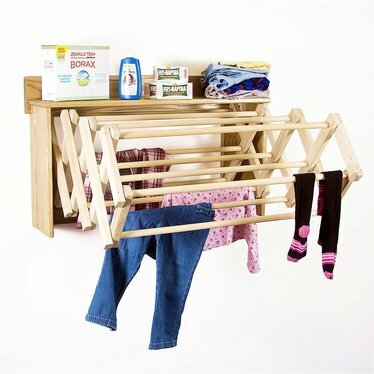 Accordion Wall Clothes Dryer With plenty of drying space, it's an indispensable addition to your laundry room. Or use it to dry herbs and flowers or to display favorite quilt pieces, linens or crafts. Just mount on wall and extend the dryer out whenever you need it. You should be able to get plastic tubing cut from a roll at your local hardware store that will just fit tightly around each wooden dowel. Slit it or ask them to slit it down the length of one side so that it snaps on tightly and voila, no MOLD! I like the drying rack, the only thing I do not like is it got mold on the wood within a month. So I need to figure out how to protect the wood from what the water has caused. Clothes are used by the Lehman wringer and leave mold on the wood. I purchased three of these. They are solid, heavy pieces and beautifully constructed. I used 'Surehook' picture hanging rail for timber frames (an aluminium z-hook or "french cleat" hanging type system) to fix them securely to the wall. Fantastic! The rack looks wonderful. However when I bought it, I didn't realize it didn't come with mounting hardware or instructions. I have had it for a few months now, but haven't been able to use it yet because I haven't a clue how to mount it. Be ware!!! This is a sturdy dry rack that hasn't molded on me yet (1 yr.) It does squeak everytime I pull it out, but that reminds me of Grandma's house. It is well built and dries more clothes than you would think. I usually use it for our jeans and other long things. Seems to be sturdy and well built. However, did not come with mounting hardware or mounting instructions, and emails enquiring about mounting have been left unanswered. I ended up mounting into studs using cabinet screws/anchors after predrilling holes in the frame. Seems to be adequate. This rack is as sturdy as you could want, and folds in and out easily. Love this rack!! !